Heavy spring rains mean rushing rivers throughout the state. Every summer thousands of people flock to the Russian River in Sonoma County to kayak, swim and enjoy majestic views. The pristine water however holds hidden dangers. On July 4, Juan Leon of Santa Rosa drowned in Monte Rio while trying to save his girlfriend who couldn't swim. Captain Terry Cerney with the Monte Rio Fire Department was searching for Leon's body when he heard a 13 year old girl scream. "She went underwater one time and I was swimming up river when she came back up and I grabbed her" said Cherney. Minutes later fire department volunteers rescued another young girl and a nine year old boy. The river is always changing. This year there is a new sandbar at the Monte Rio beach. The problem is people wading near it can suddenly find themselves out of shallow water and swimming in water at least ten feet deep. Rescuers say people need to recognize an area that you may have waded in safely last summer may not be safe now. They also recommend you always use a Coast Guard approved life vest if you are not a strong swimmer. 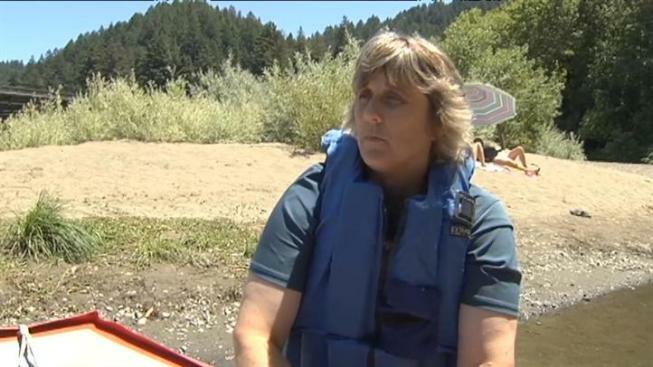 "Inner tubes and cheap air mattresses are not lifesaving devices" said Cherney. "Watch your children. All three of the kids we rescued, we never did see the parents which shows no one was watching them", said Deanna Baxman a volunteer with the Monte Rio Fire Department. "We haven't had this kind of trouble in the 31 years I've been here" said Baxman. Be sure your white water skills and experience are equal to the river and the conditions. Never boat alone. Wear a Coast Guard approved type III - V, properly adjusted lifejacket at all times when you are in or near the river. Know your limits of swimmers rescue and self rescue on white water rivers. Know when and how to swim for an eddy. Reduce injuries by wearing protective foot wear and proper clothing designed for river running. Helmets are required for Kayakers and canoeists at all times. Rafters must wear helmets in Class IV and above water. Be prepared for extremes in weather, especially cold. Know about the dangers of hypothermia and how to deal with it. When air and water temperature add up to 120 degrees or less, hyperthermia is a high risk. Wear a wet suit and booties in spring to early summer and always in Class V water. Know early signs and symptoms of heat exhaustion and dehydration in hot weather. Remember certain medications can complicate these types of environmental injuries. Know how to recognize and react to river hazards such as holes, wrap rocks, undercut boulders and walls, rock sieves, and horizon lines across the river. Carry a first aid kit and know how to use it. Learn or review medical aid responsibilities and CPR. Avoid rattlesnakes and poison oak, but know how to deal with emergencies if someone is unlucky. Never run a rapid unless you can see a clear path through it. Watch out for new snags after winter and spring floods. Allow the craft ahead of you to pass through the rapid before you enter it. This will avoid a double disaster if the leading boat blocks the channel. Remote rivers through isolated wilderness should be approached with caution, since aid is difficult or impossible to obtain in case of an accident.